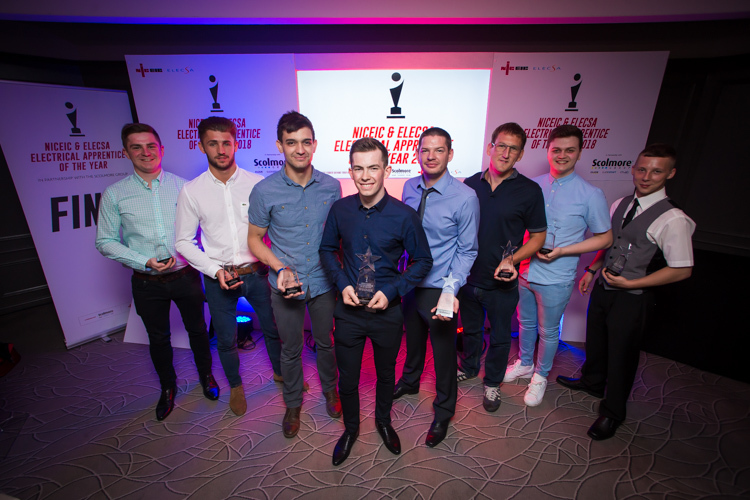 Zach Swift from Helensburgh, Scotland, has been crowned winner of the 2018 NICEIC and ELECSA Apprentice of the Year competition. The 21-year old was one of eight competitors to reach the Grand Final, which was held at the head office premises of Scolmore Group – the competition’s official partner – on Tuesday, 5 June. Whittled down from more than 650 candidates who entered the competition, the eight finalists were put through a gruelling day of challenges comprising nine separate tasks designed to assess their abilities across a range of disciplines including testing, fault finding, conduit bending, tray manufacturing and safe isolation, as well as a virtual reality test. Each candidate also had to undergo an interview with Certsure’s technical standards director, Alan Wells. As the overall winner, Zach was presented with a holiday voucher worth £2,000. Runner up Morne Louw, 30, from Barnsley received a holiday voucher worth £750, while third place went to Matt Jones, 32, from Bristol who received a £250 holiday voucher. All eight finalists were given an engraved glass trophy, an iPad and a kit bag containing an array of Scolmore’s electrical accessories.